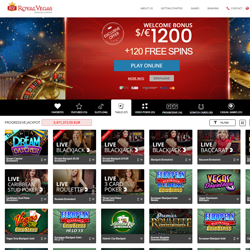 Royal Vegas Casino is your own private Vegas, accessible to you anytime and anywhere. They offer over 400 of the newest games on the net, including 40 great blackjack varieties. The bonuses are great, the promotions are frequent, and all players get access to the Fortune Lounge Players Club. This all comes together to make one great blackjack online casino. RoyalVegas Casino’s downloadable software suite is powered by Microgaming technology, so it is not surprising that the casino looks and feels great. The games are graphically intense, with added digital sound effects that push things over the top. 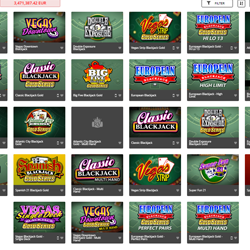 The casino is fun, easy to navigate, and installs in a snap. 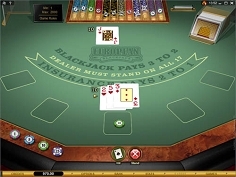 Plus, they offer a ‘Lite’ version of their casino for strictly online play – it’s Flash based, and while it has a much slimmer selection of games than the downloadable suite, these no dwonload games can be played anywhere you can connect to the internet. Out of Royal Vegas Casino’s 400+ games, about 40 of them are blackjack variants. Here are some of the titles you’ll find in the table games area of the casino lobby: Atlantic City Multihand Blackjack Gold, Double Exposure Blackjack, Classic Blackjack, High Limit European Advanced Blackjack, Vegas Strip, Spanish, Super Fun 21, and more. There are enough varieties to ensure you’ll find one that works for you – one that will let you apply your favorite strategy and start winning big! The remaining games at RoyalVegas Casino fall into the usual categories: table and card gGames, slots, video poker, and specialty games. About half of the 400 games here are slots, from classic 3-reel, single-payline machines to fancy video slots with more paylines that we can count. The video poker selection is quite small with just over a dozen different games. As far as classic games go, you will find them all here. You’ll also find a great range of progressive jackpots that could make you a millionaire in an instant! The startup bonus at Royal Vegas Casino is a six-part welcome package filled with deposit match bonuses worth a total of €/£/$1,200 in free casino cash (available in multiple currencies). Once inside, players get pampered by a rain of promos and bonuses form the Fortune Lounge Group, along with access to special sites like the International Casino Games League and the International Slots League. All new players are also enrolled in the lucrative Casino Rewards loyalty program, one of the most generous comps systems on the net. The benefits of being a Royal Vegas Casino never seem to end. Royal Vegas Casino offers a whole lot of everything, including a great selection of Blackjack games for fans to enjoy. There are also enough other games here to keep anyone busy. The bonus system is great, with a huge welcome package, a great chain of promos, and access to the impressive Casino Rewards program. What’s not to love?